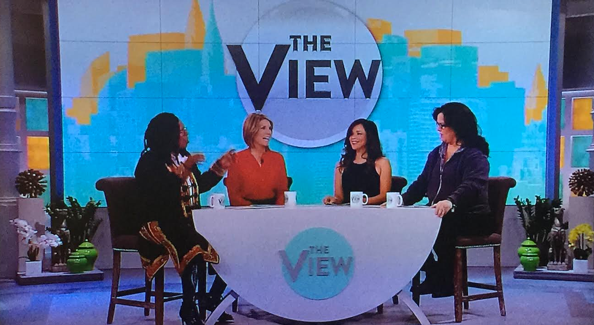 On today’s “View,” moderator Whoopi Goldberg pointed out that the show is using a new seating and desk setup. “Somebody watered the little desk we had in the garden of desks and it grew,” said Goldberg. When the show debuted its new season in September, it got a head-to-toe makeover with a brand new set from Jack Morton PDG and logo, but rumblings about the new, low arm chairs and coffee-table style desk not working very well began shortly after. The hosts’ knees often banged into the table, according to Goldberg. Goldberg, meanwhile, hinted that more changes might be coming. “It’s better than it was, it’s not where it will be,” she said. “It’s a process. Because I feel like I’m doing something illegal with this table,” Goldberg joked. Meanwhile, the hosts were seated on red-violet high stools behind the new desk, which very closely matches the look of the original one. Another change on Monday was a switch to a lighter orange shade in the backlit cubes on the set.